For many of us, a quick jog is our preferred form of exercise. But what if you need to overcome additional barriers in order to get up and running? Tie up your laces and join Katharina Loesche as she meets a couple of joggers in The Runners’ Guide. Produced by Katharina Loesche of Radio 4EB, Brisbane. Supervising production by Kim Stewart. During one of my broadcasts for The German Program at 4EB, I raffled a book. Anja, a listener, won the Prize. I went to meet Anja to hand it over and we started chatting. 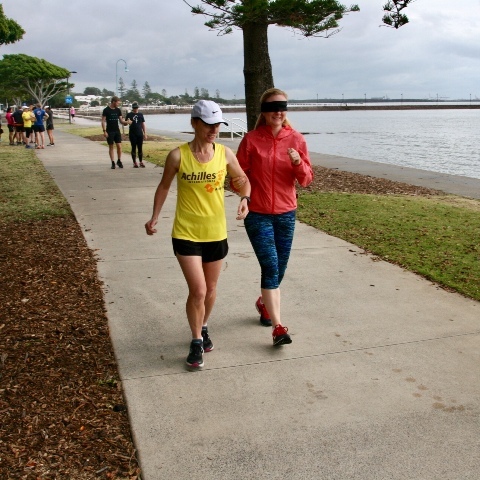 She loves running, her life is all about running and she told me about Birgit's new initiative to get vision impaired people involved in ParkRun. 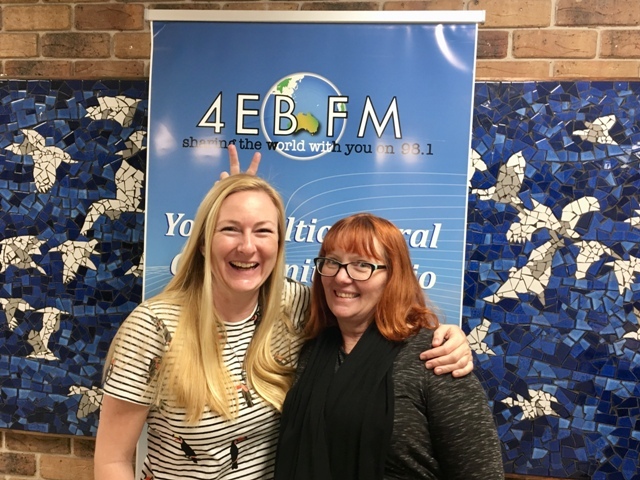 She invited me along as a potential story for The German Program on 4EB as Birgit's heritage is German too. I had to get up really, really early to get there. IMAGE: Jane, Brigit, Barbara and guide dog Gem. I’m not a morning person and my husband laughed at me, but I did it! I met so many wonderful and funny people who enjoy running, although I am totally not a runner. 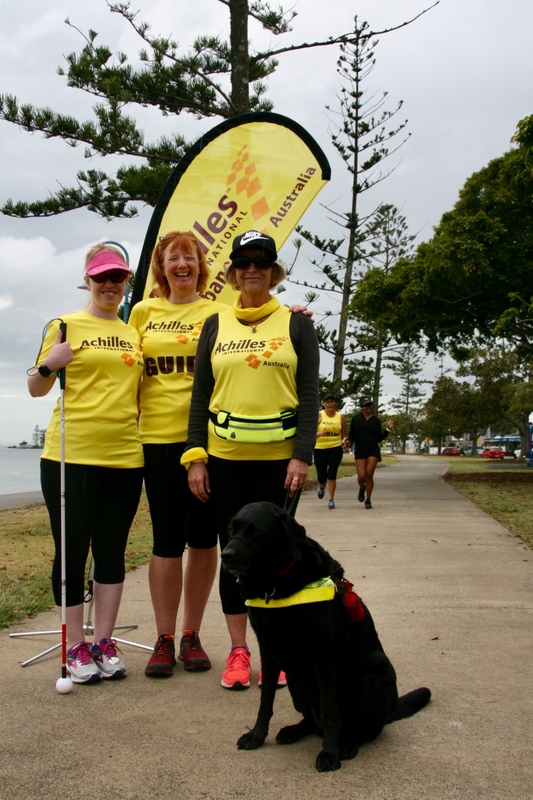 Barbara was telling her personal story to a group of runners that morning, who would like to volunteer as a guide and therefore tried running blindfolded during a workshop. I instantly loved Barbara’s quirky Australian sense of humour! And Birgit's energy is contagious! Brigit gave the participants some basic rules and tips for communication. For instance in Germany we call Guide Dogs “Blind's Dogs”, which has a completely different meaning! In addition to explaining how guiding runners works in general, Birgit had some funny rules, such as “point out the hot guys” and that the coffee afterwards is as import as the running, especially if it comes with cake! Shortly after, the NFDS 2018 call out appeared, and I thought it was a great opportunity to give this little group formed around Birgit, Barbara and Jane a voice, because it is a great inclusive community activity, that really changes lives. I would like for people to get to know about Achilles and for listeners to take the chance and join. Meanwhile, Anja became a guide herself. She always thought losing one’s eyesight would be the worst thing that could ever happen. Now as she knows Barbara and Jane and the Achilles community, it took away her fear - it wouldn’t feel like the end of the world for her anymore. It was also a great learning experience for me, because I knew very little about what it is like to be vision impaired, especially how people navigate the world. I’m still not a runner. IMAGE: As an exercise, some guides in the group get a sense of the challenges other joggers face. Kim, for being the best mentor I could wish for and for guiding me through this steep learning curve, always funny and wise! Produced with the assistance of the Department of Communications and the Arts via theCommunity Broadcasting Foundation.